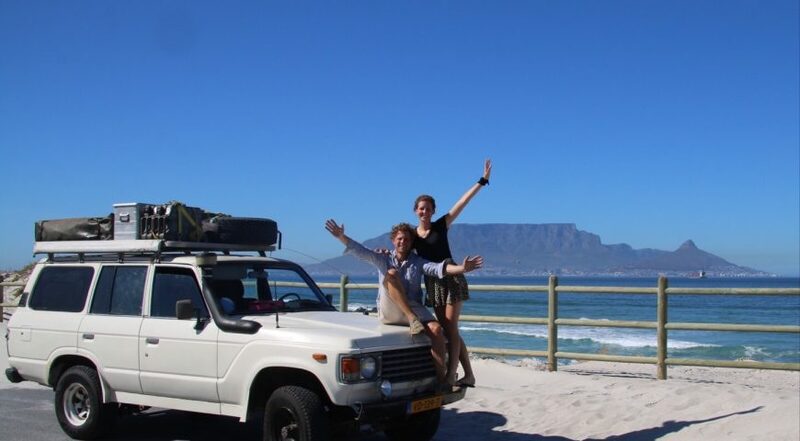 Last year, Dennis and Maartje left the Netherlands and headed off on an overland adventure together. They spent eight months sleeping in a tent on the roof of their trusty car, travelling through parts of Europe, the Middle East and down through Africa. Here’s their story. Why did you decide to take time out? Maartje: In summer 2016, I quit my job as a manager in a tech start-up and shortly afterwards, Dennis was offered a freelance software development project in Perth. It was perfect timing and we were really excited about a move to Australia. But then Dennis’ project got delayed, and it was becoming really unclear if or when it was actually going to happen. We were ready for a change, so in the end we decided to travel together for a while instead. It was all quite spontaneous, really. We made the decision to go just before Christmas, on 9th January we bought a car with a tent on the top, and on 24th April we left Amsterdam and set off on our trip. We fancied doing something a little more adventurous than usual. We thought about flying around the world taking in lots of different countries but were worried we’d end up having a really busy trip taking in just the tourist-y stops. Neither of us had travelled to Africa before and from the relatively little research we did, it felt like an easy enough route to drive. By car, you need to take it slow. We knew we might have to travel via a few countries we were less interested in, but overall it felt like a much better fit for what we wanted. So, the decision was made. We left our home just outside Amsterdam, drove down through Europe and into Turkey, Iran and over into Africa. We then travelled down the East of the continent, through Djibouti, Ethiopia, Kenya, Uganda, Rwanda, Tanzania, Zanibar, Malawi, Mozambique, South Africa, Botswana, Zimbabwe and Namibia. Did you have any worries about going? Our families were a little nervous about us heading off and the countries we were going to travel through, but we kept a travel blog so they could follow along. We loosely planned out a route and didn’t read up too much. So, our only worries were about the car, and whether it’d even make it past Germany..! Where was your favourite stop along the way? Of the twenty-four countries we visited, Uganda and Iran stand out as our favourites. Uganda is a really nice destination for a three or four-week trip – we’d recommend it to anyone, especially combined with Rwanda. It’s safe and really easy to travel around independently. You can see the Big Five there, as well as the primates. There’s lots of activity – rafting, abseiling, hiking… It’s also beautiful, green and lush. Iran was just really special. The people are extremely warm – so interested in you, always inviting you around to eat, have tea or stay over. We’d never experienced anything like it. It’s a beautiful country with lots of culture and history. Did you have an absolute highlight? We had a very special experience climbing the Ol Doinyo Lengai volcano close to Lake Natron in northern Tanzania. That part of Tanzania feels a bit like you’re on Mars. The earth is very red, there are dust storms all the time and dead animals on the ground because it’s so dry. Only the Maasai live there, plus an incredible number of flamingos on the lake. You can’t imagine anyone else surviving there for long. So, we set off at midnight to climb this volcano, just us and a guide. After we’d climbed for five hours, he left us to sleep for an hour before climbing the last section to the top for sunrise. It was pitch black, really cold and there was no shelter whatsoever, so we cuddled up under all our jackets and coats. And then we looked up to see millions of stars. It was unbelievable and so, so special. But, we didn’t actually get to see sunrise at the summit… When we woke up and began walking, loose scree started falling around us and we heard a lot of rumbling from the volcano. The guide ran away, leaving us up there with no clue about what was happening and only came back once the rocks had stopped falling. We were angry with him and a little frightened (it’s predicted to erupt soon!) so we decided to head back down. So, it didn’t end perfectly, but we’ll never forget that moment under the stars. Are there any other experiences that stand out? Spotting our very first elephants in the wild in Kenya was very special. We were driving through a national park we’d managed to blag our way into and they just appeared in front of us on the road. Also, we loved hiking together. Firstly, in the north of Iran where we spent three days with a guide – it was pretty challenging and we stayed in very basic farm accommodation, but it was absolutely beautiful. And then in Tanzania, where we hiked just the two of us from one village to the next with no guide and no other tourists along the way. Did you have any major hiccups? The main one was being unable to pass through Saudi Arabia after Iran. We really wanted to visit more of the Middle East but had visa issues getting into Saudi Arabia. Sadly, we had to skip those plans and ship our car over to Djibouti instead. It took a lot of time and money to ship the car over and we were especially sad to miss Jordan and Egypt, but we’ll go back. Did you learn anything new about yourselves? Maartje: I learned how nice it is to be more spontaneous and not have a plan all the time. At home, every weekend is planned out months in advance, and I drag Dennis along with me. But when you’re travelling you have to slow down, just be there, maybe read a book… And that’s enough. It was low season in most of the places we visited, so a lot of the time we were on our own or just with locals. I had to get used to it at first, but then started to really enjoy it. So, I’d like to take things a little more slowly now I’m back home. But, we’ll see. Dennis: I became better at small talk! Or as some people would call it, useless conversation. By the end, I could talk to anybody as long as they spoke English. Some people, well, they tell you their whole life story… Perhaps this is the reason I don’t normally do small talk! How about learnings about each other? Maartje: We’ve been together for almost twelve years, so there were no big surprises (luckily!). At the start, we had to get used to being together twenty-four hours a day, but after a couple of weeks that felt really good. I really, really enjoyed having the experience together. Dennis: The best thing about it all was that we did it together. Now you’re back, how do you feel getting back to “real life”? Maartje: We’ve been back home for two weeks and it’s really normal again already, almost as if we weren’t away. I don’t really believe that travelling changes you and you become a whole different person, but it’s like two different worlds. When I’m away, I don’t care about clothing or make up – but when you’re getting back into work and home, you start to think about it again. Looking back, would you do anything differently if you were to go on your overland adventure again? Other than researching the visa situation in Saudi Arabia better… We’d have loved to spend more time in Europe, especially the East, but it was hard to know how long eight months would last and what we could fit in. Also, we’d probably spend more time outdoors and less time in the cities, which are more similar to being back home. What did you take that you couldn’t have done without? Our phones. We didn’t do much planning ahead, so we bought a sim card in each country and mapped out our route as we went. What else? The car, some duct tape and WD40! We also played backgammon and used our e-readers all the time. Old fashioned paper maps and a compass, which we didn’t use once. We definitely could have taken half as much clothing and we both took our running shoes, which we only used two or three times. All the best intentions! Any advice for anyone thinking about going on an overland adventure of their own? Travelling in Africa was way easier than we, and everyone around us, expected. We had a little bit of food poisoning but nothing major, and we felt safe the whole time. Both of us had iPhones and MacBooks with us and had no issues at all. And finally, do you have plans to travel again in future?